As businesses see the advantages of individual health insurance, they are transitioning away from group health insurance and setting up self-insured medical reimbursement plans to reimburse employees tax-free for individual health insurance. This article examines the IRS rules for these types of tax-preferred premium reimbursement plans. With a tax-preferred premium reimbursement plan, the employer sets up a limited self-insured medical reimbursement plan, also called a Healthcare Reimbursement Plan (HRP) or Section 105 Medical Reimbursement Plan. The plan is structured to reimburse employees for eligible health insurance premiums up to a specified monthly healthcare allowance, and basic preventive health services without cost-sharing. For employers, reimbursements are tax-deductible as a business expense, the same way as premiums paid for a group insurance policy or other benefits expenses. For employees, reimbursements are not included in employees’ income and thus not subject to any income or payroll tax withholding. The tax code allows tax-preferred premium reimbursement, so long as the plan complies with IRS rules, and other applicable rules including compliance with ERISA, COBRA, HIPAA, and the ACA. There are three key IRS rules premium reimbursement plans must follow. The IRS requires that written Plan Documents are established and maintained. Plan Documents define what expenses are eligible for reimbursement, the amount of employer contribution, and other required details about the reimbursement plan. Tip: Employers should use a premium reimbursement software provider to generate custom and accurate Plan Documents that can easily be updated with plan changes. The IRS requires that employees submit proper documentation verifying their reimbursement request, and that supporting documentation is saved on file for ten years. Tip: Using a premium reimbursement software ensures compliance with IRS documentation rules. 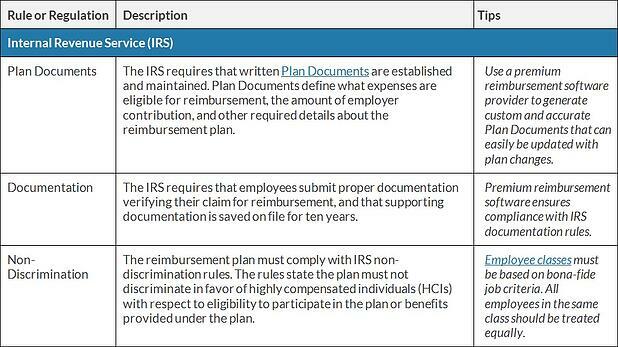 The reimbursement plan must comply with IRS non-discrimination rules. The rules state the plan must not discriminate in favor of highly compensated individuals (HCIs) with respect to eligibility to participate in the plan or benefits provided under the plan. Tip: Employee classes must be based on bona-fide job criteria. All employees in the same class should be treated equally.